3/4 bed Character Cottage in popular village, refitted Fieldhouse kitchen, large sitting room, bathroom, double garage & workshop,115' long south rear garden, DG, GCH, Views to church The property was believed to formerly have been three cottages, dating back to the 1760s which were combined to provide one larger attached cottage, with elevations of colour washed render under a pitched, tiled roof. The property enjoys UPVC double glazing and gas central heating, set in a larger than average plot with approximately 115' (35.05m) long gardens mainly located to the southern side of the property and affording views toward Bleadon church. There is also a double garage and workshop and scope for further development, subject to any necessary planning and building regulations. SHOWER ROOM White suite of tiled shower cubicle with MIRA electric shower and glazed screen, wash hand basin, low-level WC, AIRING CUPBOARD housing insulated tank, tile effect vinolay flooring, radiator, extractor, light, UPVC double glazed window to front. SITTING/DINING ROOM 29' 11" x 11' 2" (9.12m x 3.4m) South facing room with 2 UPVC double glazed windows with window seats overlooking the rear garden and affording views to Bleadon church, UPVC double glazed double French doors leading onto the garden, 2 double radiators, part exposed stone and brick walling, Inglenook style fireplace with timber surround and mantle, cast iron Range cooker with hood above, tiled surrounds and hearth, door to useful store room measuring 15' 3" x 4' 1" (4.65m x 1.24m) min. extending to 8' (2.44m) max. with wall mounted gas fired boiler providing hot water and central heating. SUN ROOM 7' 6" x 7' 4" (2.29m x 2.24m) Enjoying west and south west aspects built with polycarbonate roof, timber single glazed picture windows and single glazed door to garden. SNUG/BEDROOM 4 13' 5" x 11' 4" (4.09m x 3.45m) Exposed stonewalling, ornamental stone chimney breast with brick arch, tiled inset and hearth, double radiator, TV point, telephone point, UPVC double glazed window to side and UPVC double glazed window with window seat overlooking the rear garden, timber glazed French door leading onto the garden. FIRST FLOOR LANDING Radiator, stripped pine doors to all bedrooms and bathroom and further door leading to storage cupboard. BEDROOM 1 12' 7" x 11' 3" (3.84m x 3.43m) Plus door recess and built-in wardrobes, double radiator, telephone point, UPVC double glazed south facing window to garden and UPVC double glazed west facing window affording views over Bleadon village to the Quantocks. BEDROOM 2 11' 2" x 7' 9" (3.4m x 2.36m) Double radiator, wash hand basin with tiled splashback, wardrobe, UPVC double glazed east facing window and UPVC double glazed south facing window enjoying views to the garden and Bleadon church. 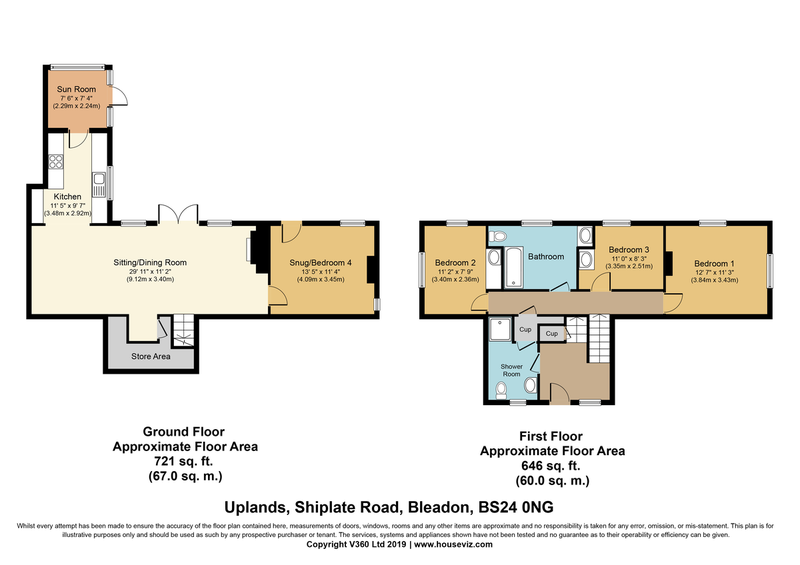 BEDROOM 3 9'7" (2.92m) extending to 11' 11' 0" x 8' 3" (3.35m x 2.51m) Double radiator, wash hand basin with tiled splashback, wardrobe, radiator, UPVC double glazed south facing window enjoying views to garden and church..
BATHROOM 8'10" (2.69m) extending to 12'6" (3.81m) into recess x 7'5" (2.26m) Fitted with white suite of panelled bath with mixer tap over, low-level WC, wash hand basin with shaver socket tiled splashback and surrounds, radiator, tile effect vinolay flooring, loft access, UPVC double glazed south facing window. WORKSHOP AREA 16' 11" x 8' 11" (5.16m x 2.72m) With light and power, west facing window overlooking the garden and double timber doors leading to the parking area.